Contemplating the rise of Thatcherism in the late 1970s Heath’s former chief speech writer, Michael Wolff, commented with evident disgust: they ‘want to wipe out the past.’1 The Thatcherite response would have been that this was a worthwhile enterprise. 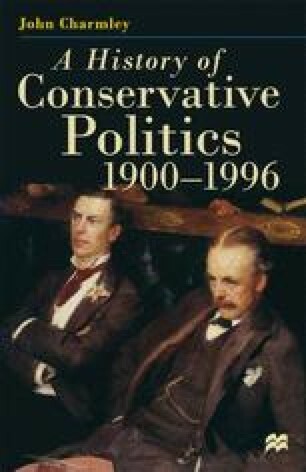 The warning given earlier about the use to which historically-minded Conservatives put their party’s history is more necessary than ever’ when contemplating the decade after the departure of Sir Alec Douglas-Home. The period was even more traumatic than the party’s previous prolonged period in the ‘wilderness’. Although in electoral terms the Conservatives did better than in the years 1906 to 1915 in so far as they actually managed to win an election, the experience of government between 1970 and 1974 was to prove a shattering one for most Conservatives and, by 1975, with a record of having lost four out of the last five elections, the party seemed bereft of direction. For the Thatcherites the story of the early 1970s is less important than what came next, whilst the liberal Conservatives grandees who dominated the party then have their own reasons for glossing over the period. It is a shame that this should be so, since a look at the policy developments of the late 1960s and early 1970s shows how much Thatcherism owes to what preceded the arrival of the great woman; but naturally neither she, nor her later opponents, would care to dwell on this phenomenon: it makes her look less unique and it makes Edward Heath seem something of a failed proto-Thatcher.